35 metre donut of 2.4mm diameter replacement Vortex line for brushcutters. 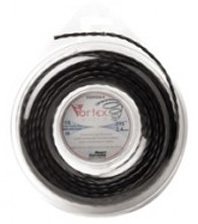 Vortex line has a unique spiral shape offering many benefits over standard round or square line. Noise is reduced by up to 50 percent, low drag increases the speed of the strimmer head and significant improvements can be made in terms of energy efficiency. Our customers have commented that Vortex line cuts cleaner than round line that in most conditions, it is longer lasting.